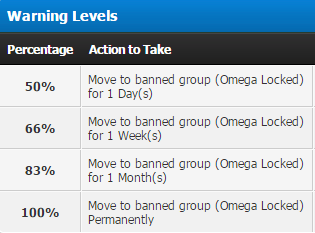 These are the specifics behind the rule violations, as well as when bans kick in. Every user starts at 0 points (0% Warning Level). Here are the points one may receive for a specific offense, as well their expiry duration. The rules may be altered in terms of content or be redefined at any time to keep the forum and a safer and better place for our members. Whenever a change is made, an announcement will be posted for every member to see. If this happens, please take your time to read the revised or additional content.